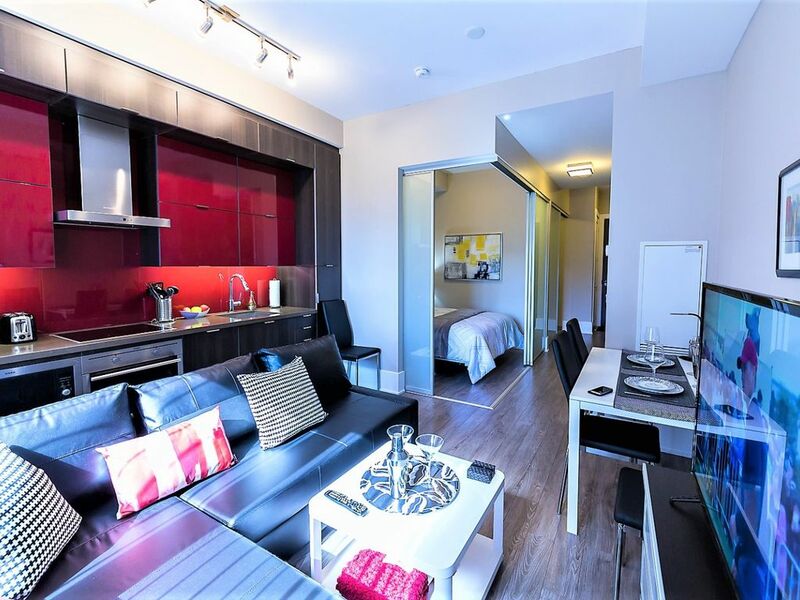 Recently Listed, Brand-new Furnished with Fully equipped Kitchen to provide Upscale Accommodations / Best Condo living experience right in the heart of Toronto's Entertainment District! Part of 300 Front St West / 20 John St Upscale Residential Condominium Complex, the Suite is located on 6th Floor and has direct view to CN Tower & Rogers Center. ABSOLUTELY NO SMOKING OF ANY KIND, NO PETS, NO EXIDING MAX # OF GUESTS ALLOWED (3 Adults OR 2 Adults and up to 2 Children), NO PARTIES in the Suite. Your security deposit will NOT be returned if your or your Visitors break these restrictions. Centrally located with great views and a super responsive (and accommodating) owner. Would definitely rent again. This small condo is perfect for 1 to 2 people. Close to convention centre, Blue jays stadium, and about 7 minutes from the subway. Owner is punctual with replies and helpful. Will come again without hesitation. The owner replied promptly to questions. He provided great instructions for accessing the apartment and info on the place. The apartment was very clean and had plenty of dishes, etc. The central location is ideal for getting around easily. We were very happy with our apartment. The location was great and the apartment was clean and modern. We liked the whirlpool and the outdoor pool and barbecue were very appealing. We are an older couple but would recommend for any age that wants to be walking distance to downtown & tourist attractions.